Rare are reunions as sweet as the one of March 22, 2005. How and where it took place, however, added a dramatic twist – which seemed only fitting for this roller coaster story. After the wild ride of waiting for paperwork from Kakamega and text updates from Pastor Charles that court dates were scheduled and post-poned, at long last our guardianship case was set to be heard on April 1. Seven weeks after I tearfully said good-bye to my husband, David, and first-born seven-year-old son, Jacob, leaving them in the US for work and school, they boarded an airplane for Kenya. Of course, when I left, we expected to be home together on US soil as a family of six by this date; but we were beside ourselves with anticipation to see one another face-to-face, no matter where in the world we might be. On the day David and Jacob left Colorado, Jedd spiked a fever. Throughout the day I monitored his temperature closely. By late afternoon, I felt his forehead with a pit of alarm in my stomach. I didn’t have a thermometer, but I had never felt one of my children so hot. I called our friend, Michael, who I hired to drive for us when we needed car transport, trying to keep the panic out of my voice. He sped to us while I gathered the three children and necessary supplies for an indeterminate time away. I knew from taking Mother Teresa children to Gertrude Gardens Hospital that it was a top-notch pediatric facility, so we raced there and progressed quickly through triage. They admitted him with a diagnosis of acute bronchitis and high fever. The three kids and I spent a restless night tucked in a room with one chair and two metal cribs. With no way to notify David and Jacob of our where-abouts, I asked Michael to bring them to the hospital the next morning upon their arrival. And so, at long last, we embraced one another with tears of joy in a children’s hospital! Jedd was decidedly better and on the verge of discharge; but it truly could not matter where we were or what conditions we were encountering, just being together was indescribably joyful. David and Jacob became acquainted with their new sister and daughter with great delight. Jacob immersed himself in the task of teaching Lily to crawl. From the beginning, she was infatuated with her oldest brother and eager to follow his example. Together they squirmed around on the cement floor of the hostel until she, too, could move independently. We hosted a birthday party for Jedd, turning five on March 25. David and Jacob brought supplies to make a cake; and miraculously, the electricity stayed steady long enough to bake it. We invited all the kids in the compound to join us in the hostel. We hung streamers and balloons and passed out bottles of bubbles as party favors. A few days later we flew to Western Kenya. Pastor Charles took us to stay at the orphanage he directed, home to about thirty kids. 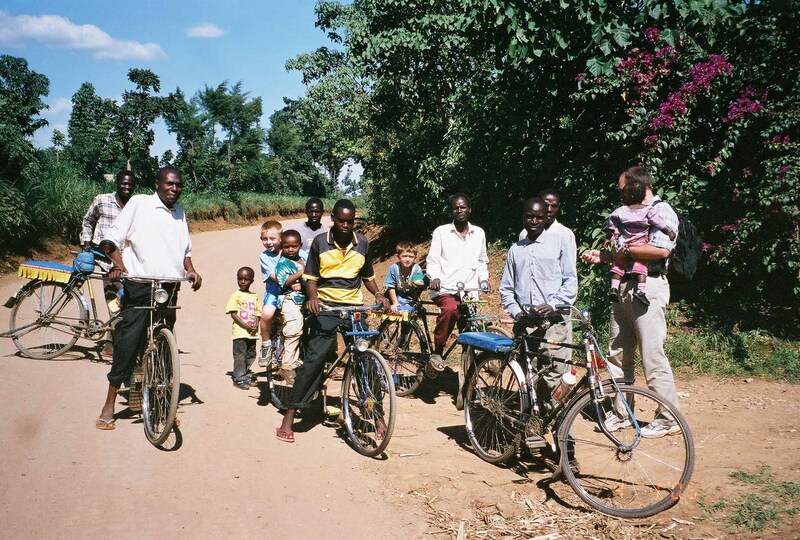 We arrived a day early, and Pastor Charles showed us around the rural town of Kakamega on boda bodas, hired bicycles with cushioned backseats for a rider. Jacob at the orphanage in Kakamega, with a “galimoto” (wire toy) made by the boy in the photo. David likes to joke that he is a boda-boda rider’s worst nightmare. Certainly his claim seemed true when we hit a long incline winding up through tropical green. Eyebrows furrowed and panting heavily, the small wiry Kenyan strained to pull his 6’2” cargo. When David offered to get off and walk, relief flooded the man’s face. The next morning, after slipping out from under mosquito-netted bunk-beds, we ate our breakfast cooked over an open fire. Then we all dressed in our Sunday best. We walked to the courthouse, four white Americans with two Kenyan kids and a couple Kenyans, decidedly not blending in. David disappeared into the courthouse building with the lawyer while I waited outside with the four kids. Hour after hour slipped by as I struggled to keep them busy, quiet, and clean in the pervasive red African dust. All around us, curious eyes followed our every move. I had no idea what was transpiring inside. At one point the kids needed to use the restroom. We walked around to the outhouse behind the court, but it was over-flowing with filth. I had no idea if we were committing a terrible cultural offense; but having no other recourse, I directed the boys to relieve themselves on the bushes. As the heat of afternoon wrapped its tentacles around us like the dread mounting in my heart, David and the lawyer emerged. With grim expressions they reported. David said he perched all morning on a wooden bench in the middle of the room, a tall white man in a sea of African faces, impossible to miss and difficult to ignore. However, the judge very deliberately avoided looking at him throughout the proceedings. The judge never called our case. Our lawyer left to pin the judge down in-person while we waited. He came back to report the judge said he would issue his decision the following week, without hearing our case. Helpless rage settled deep in my bones, beyond where tears could reach, as we walked the weary dirt road back to the orphanage. David and Jacob had traveled all the way from the US, and we flew our entire family of six out to Western Kenya for the hearing. But, what could we do but return to Nairobi? David lifted my spirits as only he can. And at long last, I could hold my oldest son close and feel the delight of his sweet spirit. Being together eased the sting of our Kakamega experience. Pastor Charles kept us informed of the lawyer’s attempts to bring the case to a close, but the verdict remained elusive. Exchange students who were staying in a guest flat in our compound returned home to Norway, and the staff invited us to move into it from the student hostel. We shared the living room with staff, who used it as an employee lounge, and the kitchen used by the compound cook, but two bedrooms and a bathroom were ours. One day we returned from a foray into town to find a celebration in our compound. People gathered in the central area, laughing and chattering excitedly. They relayed the story to us. A security guard glimpsed the snake in an outhouse. He piled trash inside and incinerated the building. Now, everyone examined the torched carcass, looped over a stick, with a mix of fascination and horror. Our family joined “the-snake-is-dead” party. Every good African story must have a snake antagonist. Now we had ours. We stepped outside the compound as the security guard placed the charred remains beside the gate as a warning to any other snakes who might want to enter. Desperation filled my heart as David’s and Jacob’s departure date loomed. In the absence of concrete information from Kakamega, I had no idea when we would see them again. On April 16, the eve of our twelth wedding anniversary, the younger kids and I stood there weeping as a cloud of dust from the vehicle carrying Jacob and David to the airport enveloped us. For the children’s sake, I wanted to be stable and stoic; but I couldn’t hide that I was falling apart. That night, I crawled under my mosquito net, longing only to be swallowed into sleep-oblivion. But fear and anxiety tangled my mind like the rattle of rats I could hear, pilfering through our plastic-bagged-food in the living room. A child whimpered in sleep, and the oozing of my own tears threatened to suffocate me. For every prayer uttered over the last several months, the answer seemed to arrive upside down. Through that long night, I clung to a barely discernible whisper somewhere deep in my heart, “Fear not, for I am with you.” Isaiah 41:10. It was a time to dig deep. A time to believe there was something happening beyond what we could see, a time to endure the “removal of what is shaken so that what cannot be shaken may remain.” Hebrews 12:27. It was time to discover that though I could lose my money, dignity, family members’ presence, strength, peace of mind, home, and even one of my children if Lily’s adoption should fail, that though “my flesh and heart may fail, God is the strength of my heart and my portion forever.” Psalm 73:26. In the following days, my repeated entreaties to Pastor Charles for updates only brought reports of a delayed verdict. Maybe the judge waited for a bribe, or maybe rumblings from Nairobi about new interpretations of adoption laws finally dissuaded him from deciding in our favor. At any rate, finally we received our answer in late April. The ponderous gavel crushed our hearts: our request for guardianship was denied.